Are you there? Anyone still alive? For supporters of US president wannabe Hillary Clinton, it might as well have. We survived exploding Samsung phones and washing machines for this? 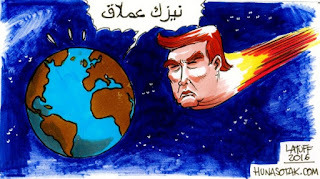 That asteroid is of course Mr Donald J Trump, the next president of the not so United States. Where was Bruce Willis to blow up the crotch-grabbing space rock threatening to destroy the Earth when you needed him? Instead of the Armageddon hero, who did Mrs Clinton get to endorse her? Beyonce? Katy Perry? Lady Gaga? All of them were no match for Scott Baio. But didn’t the polls say the former First Lady would win the election? As it turned out, it was a perfect illusion. I, too, was stunned by the outcome like I was groped by a 70-year-old real estate tycoon. Maybe we can blame the train wreck on a “rogue train”, like the one blamed last week for the disruptions plaguing the MRT Circle Line. Hey, that could be the next Star Wars movie — Rogue Train One: An SMRT Story. I’m so traumatised by a Trump presidency being forced onto the world that I feel like writing to Teenage magazine’s Dear Kelly for advice on how to cope. Yes, maybe I’m naive, but I didn’t ask for it — even though I sort of predicted the Republican’s victory six months ago. To try and make sense of it all, I reached out to an American friend whom I suspected of being a Trump supporter, based on a Facebook post or two. She lives in a rural part of Wisconsin, a state which has consistently voted for the Democratic presidential candidate since 1984 — until now. She’s Caucasian, 41, and is studying to be a nurse while working part-time. Married with three grown children including a daughter with Down Syndrome, she also volunteers with the Special Olympics. She confirmed my suspicion with a quick “Yup”. “I like the fact that he’s not a career politician and I think that we need someone in who is going to work for the country. “Was I happy about that? No. But everyone at some point has said stuff that he did, women included. “Is everyone perfect? Hell no! 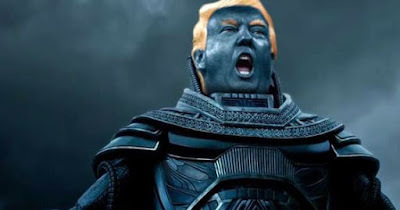 So for my friend and the 60 million Americans who voted for the man behind Trump University, it certainly wasn’t the end of the world even as Lady Gaga and thousands of anti-Trump demonstrators protested around the country after the election. I, for one, am glad that the world didn’t literally end because then I would have missed out on all the great Singles Day sales on Friday. I read that ex-California governor Arnold Schwarzenegger is replacing the Donald on Celebrity Apprentice. Could The Terminator star one day become the leader of the free world too? I have seen T2: Judgment Day. Will you be ready for Arniegeddon?